The journey from text to pulpit can be a long and winding road, filled with false starts, surprising discoveries, and hard choices along the way. On a semi-regular basis, the homiletics faculty of Concordia Seminary invites you to walk the road with the preacher in the Preacher’s Studio sermon series. Each sermon was preached during chapel services at the Seminary. The audio for the sermon is provided below. Afterward, the campus community was invited to eat lunch with the preacher, to talk about the sermon, its preparation and execution, and dialogue about the art of preaching. We welcome you to a seat at the table. Moderator: David Schmitt, Gregg H. Benidt Chair in Homiletics and Literature, Concordia Seminary, St. Louis. 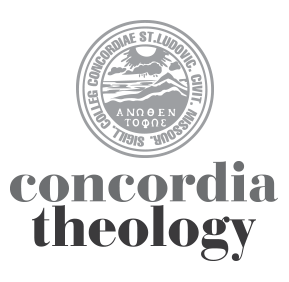 The audio and video files can also be downloaded at Concordia Seminary’s iTunes U site. Can anyone tell me where the Calvin Miller article on screens that Dr. Nielsen refers to is located? It is from a journal called Preaching. March/April 2011 isue. It is titles, “Getting Intimate on the Jumbotron” pages 70-71. Have you written an article explaining in greater detail the new method of sermon preparation so that delivery can be done without a manuscript? Blessings! Good to hear from you! I have not written anything about how to preach without a manuscript. A couple comments though. First,I continue to preach about two times a month at Grace Lutheran Chapel in north St. Louis, and I do write a manuscript for my sermons. However,I don’t bring the manuscript with me when I step before the people to preach. I leave it back in the sacristy or at home. What that does is push me to write the manuscript in the most memorable way I can. When you know you’re not taking the manuscript with you, you learn what you can remember and what you can’t. It changes the type of sentences you write, length of paragraphs and the type of materials you will put into the sermon. Once you do that for a while, you also develop your memory skills so that remembering what you will say comes much easier. Second, I make much use of visual and storied materials as they are easier to remember — both for the preacher and the people listening to you. Most research I’ve read says that about 80% of Americans are visual learners.